The original version of this album lists the recording personnel as Ozzy/Randy/Don Airey/Rudy Sarzo/Tommy Aldridge, but Sarzo & Aldridge didn’t play anything on the album – something they duplicated on Whitesnake’s 1987 CD. Sarzo & Aldridge are credited, but the bass & drum bits were played by Bob Daisley & Lee Kerslake. The Live version of I Don’t Know on the 2002 version originally appeared as a B-Side to the “Flying High Again” single. It did not appear on the 2011 version. There is a widely spread and believed story that this album was recorded at the same time Blizzard of Ozz was. It was not – they were recorded separately. 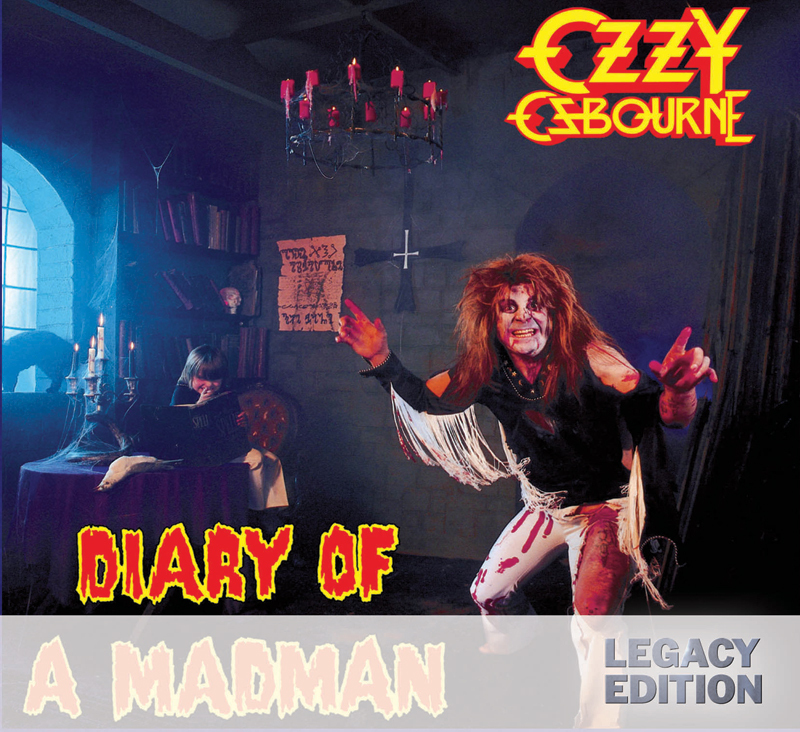 After recording the album (but before it was released), Bob Daisley & Lee Kerslake were fired, and Rudy Sarzo & Tommy Aldridge’s pictures were put on the album as having played on it – they didn’t. Same thing goes for Don Airey. For the longest time it was assumed by this website’s author that it was Don Airey, but in Oct 2005 it was discovered it was really Johnny Cook, not Don Airey who played keyboards on this album. The 2011 version of this album was released in the US as a 2 disc “Legacy Edition”. In Europe that version was released too, however, a single disc with just the studio album was also released. S.A.T.O. ‘s original name was “Strange Voyage”. After Bob Daisley was fired, the song was renamed to “S.A.T.O.”, which stands for Sharon Ardon / Thelma Osbourne. Not “Sailing Across the Ocean”. Thelma also designed the outfits on the cover art; she was still married to him at this point. The cover art layout (both front and back) was designed by Steve “Krusher” Joule, who also did Black Sabbath’s Born Again album a couple of years later. Interview with Steve “Krusher” Joule about the creation of the cover art. The live disc is great, but I’m trying to figure out where it was recorded. Anyone has a clue? Don Airey was not the keyboardist on the U.K. and U.S. Blizzard tours as stated above. It was Lyndsey Bridgewater. As for the Ozzy Live disc, it’s widely believed that the bulk of the recording is from the Circle Theater 8/28 gig in Indianapolis, except for the song FHA which is the version from the famous Montreal radio broadcast. Randy Rhoads’ solo and the extended Mr. Crowley intro are from one of the U.K. 1980 Blizzard shows. Great live disc! Most the live disc is actually from Montreal, July 28, 1981 while the extra guitar parts are from Southampton, Fall of 1980. Sorry dude but you’re completely wrong….only Mr. Crowley & FHA are from the Montreal show. Anyone knows what the f*** means the symbols (or letters) in the booklet of the 1981 CD edition?? Theban Alphabeth, it’s written “THE OZZY OSBOURNE BAND”. I’ve reposted it because I’m in troubled connection and didn’t know if the first time was made… sorry! Thank you, mate. I had no idea about that alphabet.